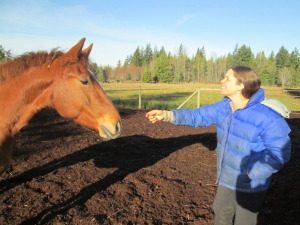 Safe companionship: (at liberty) Your horse should see you as a benevolent leader, one who looks out for his best interest almost more than your own. An easy way to begin to develop this relationship is to walk in front of him in the field and look up at the sky or down at the ground without asking anything from him, gently stroking or petting him. We spend so much time on our goals and we want to get them fast like checking items off a list, but remember those are not his or her items, not his or her goals. Occasionally picking grass and handing it to him teaches him that you are looking out for him. Spend a day or two or a week just being his companion. A field is the best place for this if possible. Reading the horse’s body language: If you do not know the horse or you are learning about horses, here are some important tips: If a horse’s head is down, he is generally calm; If he raises his head that is a signal that something is wrong-he could be worried or sees a potential predator. If the horse’s head is up, be very careful and try to calm him. If the horse shakes his head, he is saying, “No.” Please be mindful of a horse that repetitively shakes his head. He could be confused or uncomfortable. If a horse does not bear even weight on all four legs or points a front foot, there could be a painful situation with a foot or leg. If his back twitches when you try to put the saddle on, he could have a chiropractic issue or a saddle fit issue. If he is hard to keep weight on, ribby or sucked up with intermittent runny stools, please understand there could be a problem needing addressing, like GI ulcers. A good holistic veterinarian can help heal these issues and keep your horse comfortable. It is not fair to ask an uncomfortable horse to do any techniques or training.